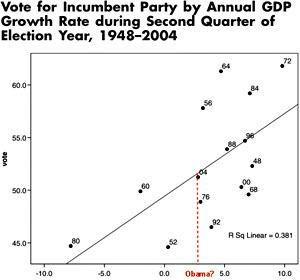 plug that value into Alan Abramowitz’s simple linear fit of second-quarter GDP in election years and presidential election performance, we find Obama right around where President Bush was in 2004. The regression on the right is not the entire Abramowitz model and doesn’t take into account the advantage of being an incumbent running for reelection. That’s dealt with in his full model and adds a couple of points to the forecast for a four-year incumbent. For that reason, this chart almost certainly underestimates Obama’s odds of winning in 2012. However, as Brendan points out, there’s also a lot of uncertainty around that growth forecast of 2.9%. If the economy ends up at the low end of projections in early 2012, Obama will be in a precarious position. Still likely to win, I think, unless we slip back into a full-blown recession, but it might be a close run thing.